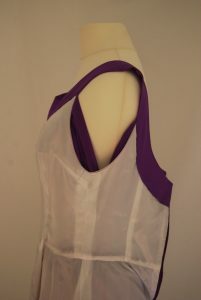 Interior lining showing how it is attached at the neckband, but not the armhole which makes the dress more fluidity suiting the draped fabric also. The inside darts are machine finished and uniform throughout, suggesting this pattern was not made to the wearer’s specific measurements. It was probably made from a sewing pattern.